The banker Agostino Chigi, who was a major sponsor of artists during the Renaissance, was born on this day in 1466 in Siena. At its height, Chigi’s banking house in Rome was the biggest financial institution in Europe, employing up to 20,000 people, with branches throughout Italy and abroad, as far apart as London and Cairo. Chigi invested a good deal of his wealth in supporting the arts, notably providing financial backing to almost all the main figures of the early 16th century, including Perugino, Sebastiano del Piombo, Giovanni da Udine, Giulio Romano, Il Sodoma (Giovanni Bazzi) and Raphael. 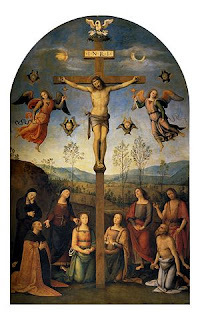 Perugino painted The Chigi Altarpiece, dated at around 1506-1507, which hangs in the Chigi family chapel in the church of Sant'Agostino in Siena. Chigi’s significant legacy to Rome was to have built a chapel in the church of Santa Maria della Pace, another - his mortuary chapel, the Chigi Chapel - in the church of Santa Maria del Popolo, and the superb suburban villa in Trastevere, on the banks of the Tiber, which since 1579 has been known as the Villa Farnesina. 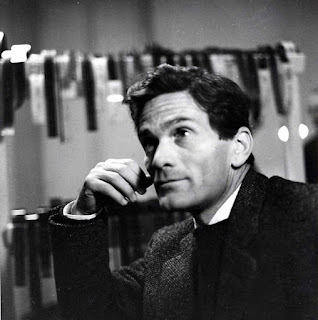 Agostino Chigi was the son of the prominent Sienese banker Mariano Chigi, from an ancient and illustrious Tuscan family. 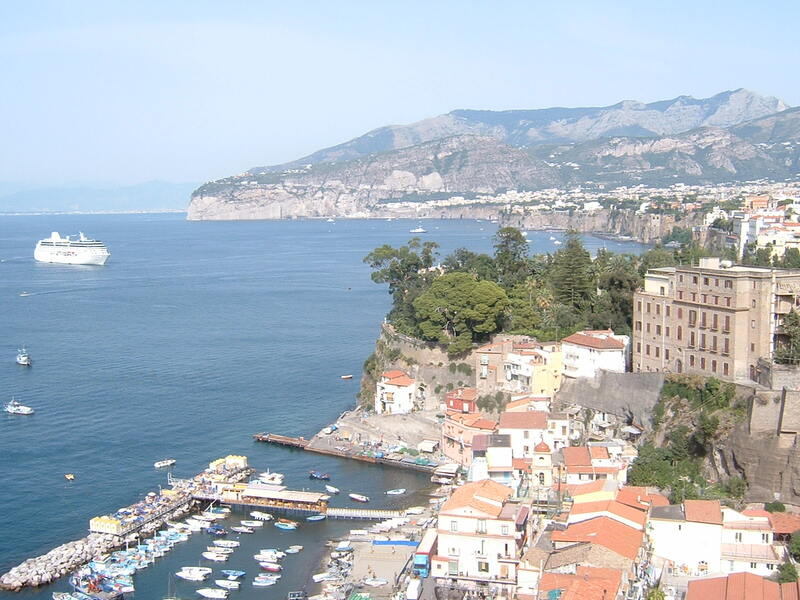 He moved to Rome around 1487, taking with him a rich fund of capital. He grew the wealth of his own bank by lending considerable sums to Pope Alexander VI and others, and by diversifying from regular banking practice by buying monopoly control of salt mining in the Papal States and the Kingdom of Naples, as well as that of alum, a mineral used in the textile industry. After the death of the Borgia pope Alexander VI and his short-lived Sienese successor Pius III Piccolomini, Chigi helped Pope Julius II, in return for which he became treasurer and notary of the Apostolic Camera. Agostino even accompanied Julius in the field in his military campaigns and went to Venice on his behalf to buy Venetian support for the papal forces in the War of the League of Cambrai. Work began on his magnificent palace in Trastevere in 1506. Chigi took the unusual step of commissioning an untried pupil of Bramante, Baldassare Peruzzi, to design and oversee the construction of the villa, although he may have been helped Giuliano da Sangallo, the favored architect of Lorenzo de' Medici. Raphael's fresco The Triumph of Galatea. His design differed from that of the typical urban palazzo, which tended to be rectangular, with an enclosed courtyard. This villa, intended as an airy summer pavilion, had a U-shaped plan with a five-bay loggia between the arms, facing north, which was the main entrance. The best known element of the sumptuous decorations are Raphael's frescoes on the ground floor, both in the loggia depicting the classical and secular myths of Cupid and Psyche, and in the east-facing loggia, depicting The Triumph of Galatea. This was a mythological scene from an intended series inspired by the Stanze per la giostra of the Florentine poet Angelo Poliziano. It shows the near-naked sea nymph Galatea on a shell-shaped chariot drawn by two dolphins, surrounded by other sea creatures. 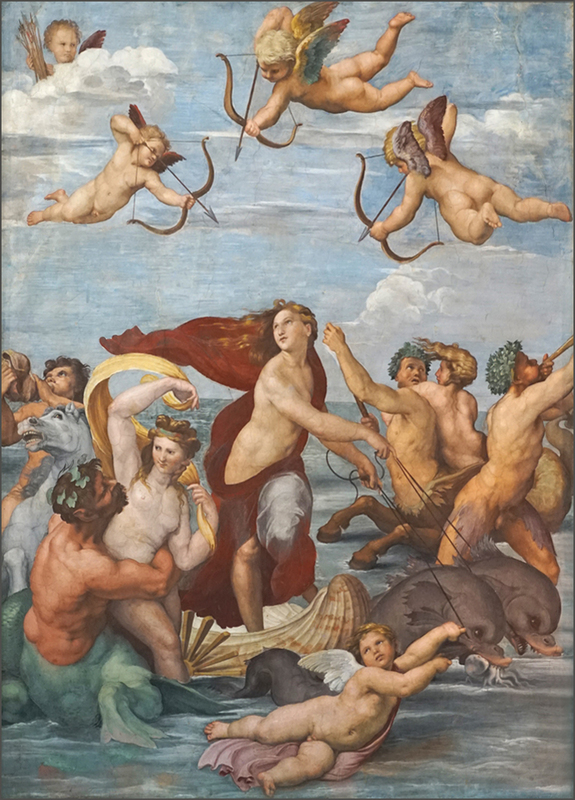 It has been noted that Raphael’s Galatea bore similarities to the courtesan, Imperia Cognati, who was Agostino Chigi's lover and is said to have posed for Raphael on more than one occasion. The art historian and Raphael's near-contemporary, Giorgio Vasari, noted, however, that Raphael had said that Galatea was the product of his imagination, an idealised beauty. 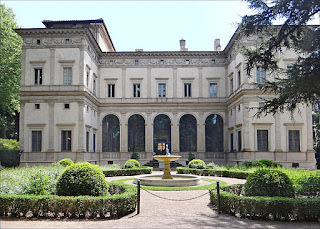 It was at this villa that Chigi held sumptuous banquets. 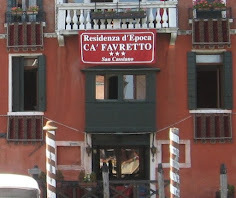 He was recognised as the richest man in Rome but was said to have affected a contempt of money by throwing silver dishes into the Tiber at the end of the parties, although it is thought his servants were on hand to collect them in nets draped under the windows. The villa was called the Viridario in Chigi's time. 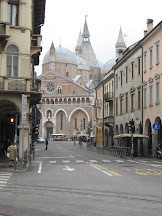 It became the property of the Farnese family in 1577, more than a half-century after his death. 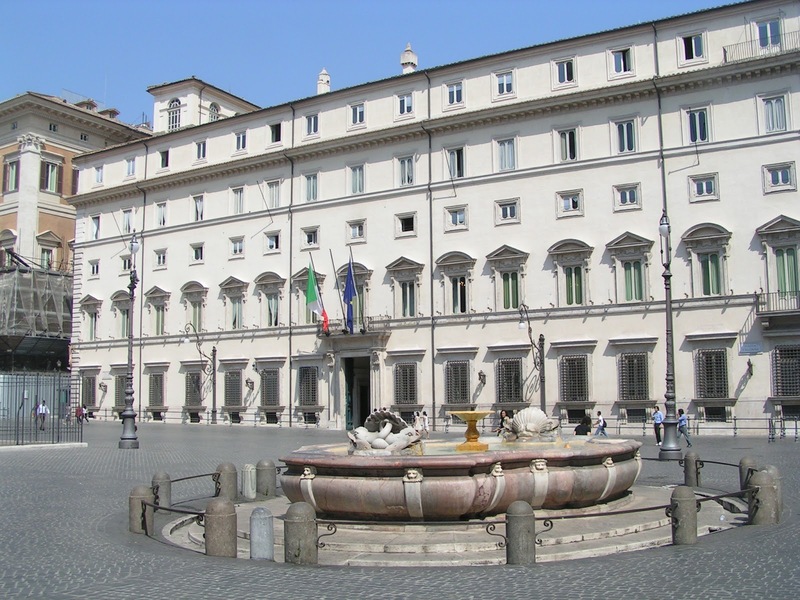 The Palazzo Chigi, the current official residence of Italian prime ministers, was bought by Fabio Chigi, related to Agostino as a descendent of his father’s brother, shortly after he became Pope Alexander VII in 1655. 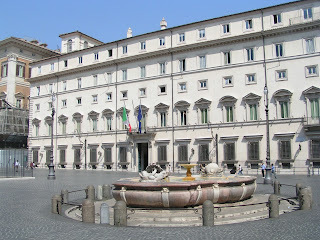 The 16th-century Palazzo Chigi, which overlooks the Piazza Colonna and the Via del Corso in Rome, was begun in 1562 by Giacomo della Porta and completed by Carlo Maderno in 1580 for the Aldobrandini family. It was in the ownership of the Chigi family, who had it remodelled by Felice della Greca and Giovan Battista Contini, from 1659 until the 19th century. 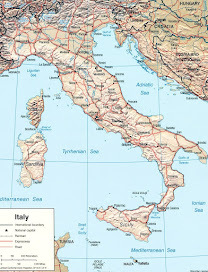 It became the residence of the Austro-Hungarian Ambassador to Italy in 1878 before being bought by the Italian state in 1916, when it became the home of the Minister for Colonial Affairs. 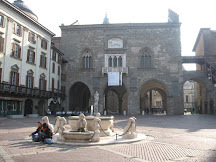 Later it was the official residence of the Italian Minister of Foreign Affairs and in 1961 became the official meeting place of Council of Ministers, whose president is the head of the Italian government - the prime minister - and can now use the palace as his official residence.